There is not enough iCloud storage available. How to back up iPhone? Home » There is not enough iCloud storage available. How to back up iPhone? You might have already encountered an annoying iCloud popup: “Not Enough Storage. This iPhone cannot be backed up because there is not enough iCloud storage available.” The free 5 GB of iCloud space that Apple offers is largely inadequate for storing iPhone and iPad backups. This article explains how to back up iPhone without subscribing for paid iCloud storage. We also demonstrate how to get rid of the iCloud popup message that won’t go away. 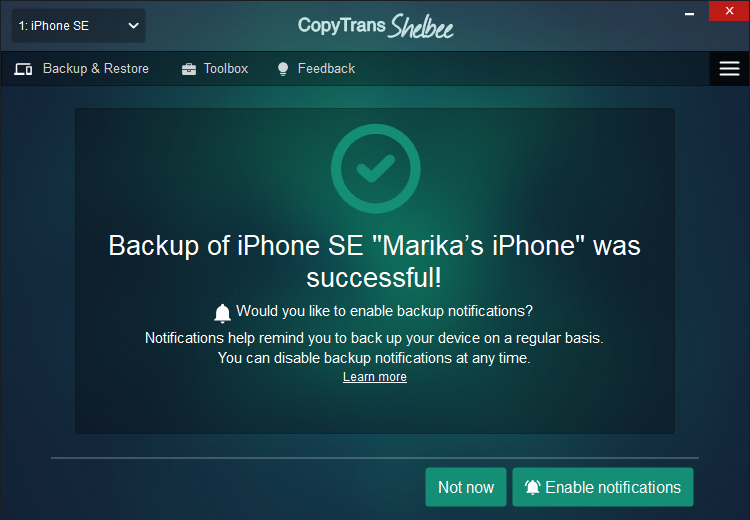 Unlike iCloud, CopyTrans Shelbee can back up the iPhone wherever you want. Therefore, you don’t have to worry about storage limitations. Just choose any location with plenty of free space. To begin your iPhone backup, run CopyTrans Shelbee and plug in the iPhone. Click “Backup”. NOTE: CopyTrans Shelbee a dedicated iOS backup utility. It will never ask you to “erase and sync” when least needed as iTunes would. Now it’s time to choose a backup location of your convenience. Neither iTunes, nor iCloud will give you a choice to do that. To select a backup location, click the green pencil symbol on the right. TIP: Be sure to select a drive with enough free space. iOS backups often take up several GBs. Ready to back up? Hit the “Start” button. NOTE: Unlike iTunes, CopyTrans Shelbee will never overwrite your previous iPhone backup without permission. The iPhone backup begins. 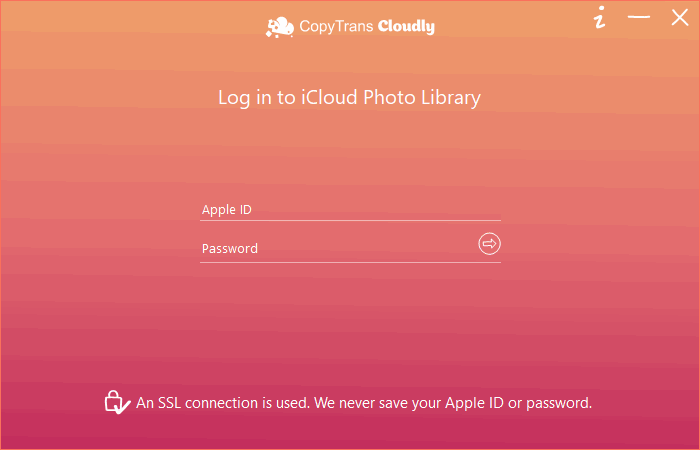 CopyTrans Shelbee will complete a full-featured iOS backup of iOS messages, contacts, app documents, calendars, photos and videos in the Camera Roll, and settings. Wait for the backup to finish. Learn more. Upon backup success, click “Done”. The backup made is saved to the folder of your choice. 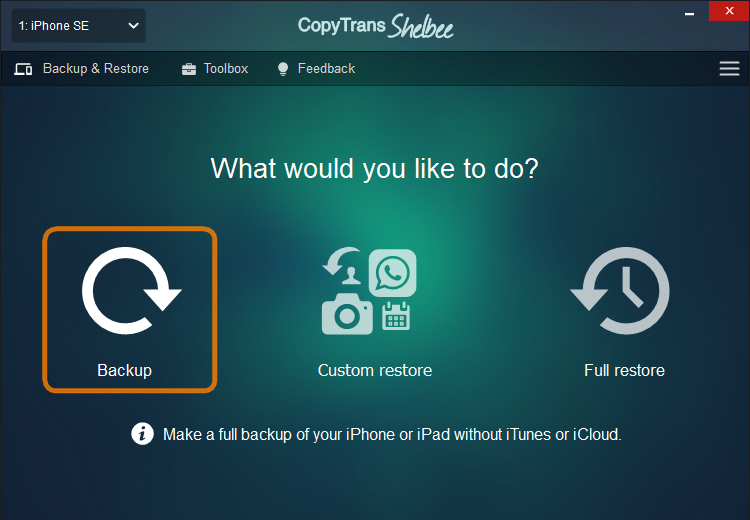 You can use CopyTrans Shelbee to restore from the backup at any time. On the iPhone, go to Settings > tap on your name > iCloud > tap Manage Storage. Disable the the most space-hungry element, usually those are iOS backups or iCloud Photo Library. NOTE: The Photo Library could easily take up most of your iCloud space. When you disable a backup element, the information from that element is immediately deleted from your iCloud storage. To reduce the total footprint of your iPhone backup in iCloud, you can alternatively remove some photos and videos from your Camera Roll. Run the app. Enter your Apple ID and password. Now you will need to confirm that you want to delete ALL your photos and videos from iCloud by clicking the checkbox. Important: Please note that your photos and videos will be deleted from all the devices that are associated with the Apple ID you logged in with. Voila! All you need to do now is wait until all your photos and videos are deleted. This is how to back up iPhone in case you don’t have enough iCloud storage available and how to get rid of the nagging iCloud popup.